Woodrow B. Culpepper, d. 30 Jul 1998 at 85 years in Macon Co., GA; Res. in Macon Co., GA, 032638. E-mail written 2000-2007 to Lew Griffin & Warren Culpepper from Gary Curtis Culpepper (#39247), East Orange, NJ, e-mail address. Gary Culpepper is a Music Producer, Arranger, Singer, Songwriter and Vocal Coach. Also President and CEO of Torch Light Productions Inc. Your letter came today.Yes there is a mistake in David Reeces stone at the time an older cousin of mine convinced me his name was Thomas David. But as I did more research I found it was William. I have a copy of the marriage certificate of Mary Donaldson to William D. Reece. I was admitted to SAR on the line of William Donaldson her grandfather. I also have a supplemental certificate of Benjamin Culpepper, another on Daniel Carmichael Mary's father. "Notable Southern Families" has a record of her marriage to David. The stone looks better than two sand rocks next to nothing.People may have another to replace it if it is of the same quality. I will send you some proof when I have time to go though my papers. David was not a descendant of the "signer', another mistake. 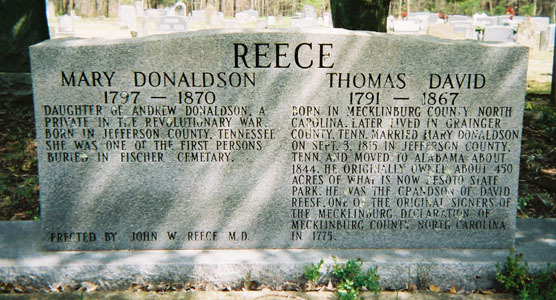 I am a descendant of David Reece and Mary Donaldson who moved to DeKalb Co., AL in the 1830's. I am from their son William Donaldson Reece who married Nancy L. Harpe. I have been unable to find ANYTHING that gives David as being William David Reece, or Thomas David Reece or William Thomas David Reece. I have him in the census records as David Reece, and I have William's death certificate that says his fathers name was David Reece and mother was Mary. I think I have a marriage record for them somewhere that I need to find, but I believe it also lists him as David Reece. I have a picture of a stone that they say was taken in Fishers Cemetery that shows David as being in the war of 1812 in Benton's regiment. I have land records issued July 15, 1854 to William D. Reece and his brother John Reece or maybe it was Jehu Reece. It is hard to tell the difference between John and Jehu when they are written out. This is from the Bureau of Land Managment. This was a few months before William married Nancy Harpe. William is also listed on another Bureau of Land Management record in 1860. Both are for 40.04 acres. Have you found anything that would prove that William and Jehu had brothers by the name of John or Jesse Andrew Reece? I have been unable to locate anything that proves they were brothers. I know that my William and your Jehu were brothers. The 1880 census shows that John Reece and Andrew Reece were living in DeKalb Co., AL. Andrewe Reece's mother Mary was listed with him in 1880. William and Jehu's mother Mary died circa 1870. I think Andrew Jesse Reece was a cousin of William and Jehu, but am unable to prove this. I have been unable to verify anything about John Reece. In 1880 John, William and Jehu who listed in Township 6 and Andrew was in Township 7. The 1840 census of DeKalb Co. AL shows that David Reece had two sons born between 1830 and 1835. This should be Jehu and William. It shows one female under the age of 5. This should be Hannah. It also shows two females 15-20 - one of these would be Mary but I dont know who the other one is. The 1830 census I Have shows that they were in Grainger Co., TN, but I can not prove that this is our David. There is a male in this household born 1815-1820. I don't know who this is. A lot of people say that this is Jesse Andrew Reece, except that he was born less than 4 months after David and Mary married. He was listed in Cherokee Co., AL census records of 1850 and there was a widow Mary Reece listed there also. This Mary seems to be the same lady as the Mary Reece listed in the 1880 census living with Andrew Reece listed as mother. The 1830 census for David also listed another male born between 1825 and 1830, but this male doesn't show up in the 1840 census. This fits the right age for John. However I am only able to find the 1860 and 1880 census records for John. In 1860 he is living in North Bend, DeKalb Co. AL and David is in Valley Head, DeKalb Co., AL with his son Jehu living with him and William listed next to them. E-mail written Mar 2009 to Lew Griffin from Calvin Dorris, Whitney, TX, e-mail address. P. 548, family 1068, East Macon District, 29 Jul 1860. P. 740, Subdivision 8, Macon Post Office, family 2215, 23 Aug 1870. P. 165: William B. as age 50-60, and so born in the 1770's. His wife was born in the 1780's, and they had two daughters under age five in 1830. They have five sons. The son under five was probably Samuel; the son 5-10 was probably Green; of two sons 10-15, one was probably R. B.; the son 15-20 was probably W. H.
Ancestry.com, Public Family Trees, Rittenberry. Year: 1930; Census Place: Neptune, Monmouth, New Jersey; Roll: 1372; Page: 17B; Enumeration District: 0092; Image: 236.0; FHL microfilm: 2341107. Charles W Rittenberry 3 & 10/12. Year: 1940; Census Place: Jersey City, Hudson, New Jersey; Roll: T627_2409; Page: 16B; Enumeration District: 24-282. E-mail written 2000 to Lew Griffin from Southlake, TX Bob Rittenberrry. * Charles H. Culpepper,, Jr., 1, M, Sng, born Tachikawa, Japan. Obituary of Charles Hamilton Culpepper Jr. (#39269), published 7 Jul 2006. Obituary of Dorothy L. “Dottie” Monasco Culpepper (#39266), published 20 Sep 2008.